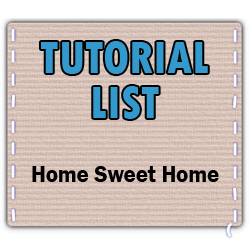 Here are links to almost completely thorough lists of the tutorials that are available on Craftster's Home Sweet Home boards. Some tutorials were excluded for lack of pictures and no tutorials listed on other sites were included. Yes I have saved these addresses for future reference. These are very useful. God I love these tutorials. I really loved these tutorials and will definitely try some in my spare time. Waiting for some more like this. Thanks for sharing this good ideas, will definitely try this.